This week’s drastic temperature turnaround has left the Chesapeake Bay region with whiplash, as windchills in the single digits and teens turned into a record high of 74 degrees— just a handful of days later. At the worst of the Arctic cold front, the National Weather Service issued snow squall and gale warnings in the Bay region. The Coast Guard Capital Region Captain of the Port set “Winter Port Condition One,” warning boaters to use caution because ice formation was likely. The Maryland Department of Natural Resources sent one its four ice breaker buoy tenders, M/V J. Millard Tawes, to Smith Island at the request of ferry boats and a marine contractor. Luckily, from Sunday on, daily temperatures were back above freezing and climbing. The warmup was welcomed by much of the Bay, of course, as the sun started chipping away at the ice covering many waterways. On Tuesday, a record-breaking 74 degrees was measured at Reagan International Airport in Arlington, Virginia. It blew away the old record of 70, set in 1991 and 1890. Despite the relative “heat wave,” the Coast Guard is still listing reports of ice in some Bay tributaries. And that means boaters out enjoying the unseasonably nice weather still need to be on alert for areas of ice, no matter how warm the air feels. As of Wednesday morning, the Coast Guard reported the C&D Canal east of Chesapeake City was still 40 percent covered with four inches of pack ice. The U.S. Army Corps of Engineers has imposed restrictions on the Canal, allowing only vessels with steel hulls and 1500 horsepower to pass. 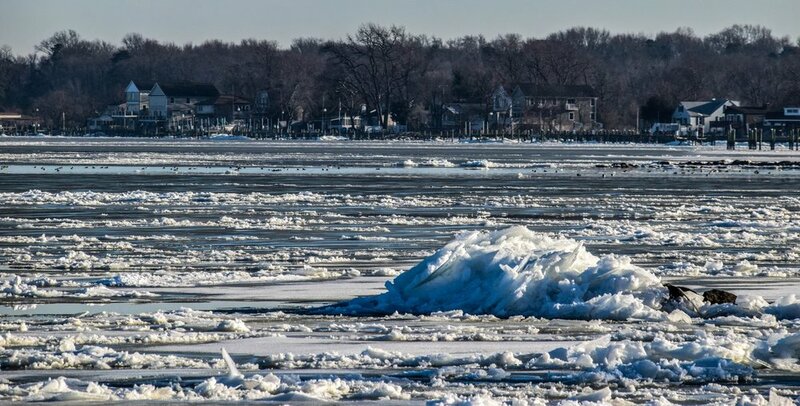 USCG reports some ice remains on the Patapsco and Chester Rivers, near Pooles Island, at the entrance to the Choptank, from Holland Point to Cove Point, and on the Nanticoke River. No matter how much ice is left in a given area, the Coast Guard warns mariners that ice may have destroyed or dragged navigational markers off their stations, so proceed with caution.